We are finally getting some kitchen renovations done. We decided to update our ugly tile countertops with Glacier White Corian. We went with corian mostly because of the the price and durability, but also because I wanted a solid color. I don't like the variations in color in granite and although I love quartz, it was way to expensive for us. 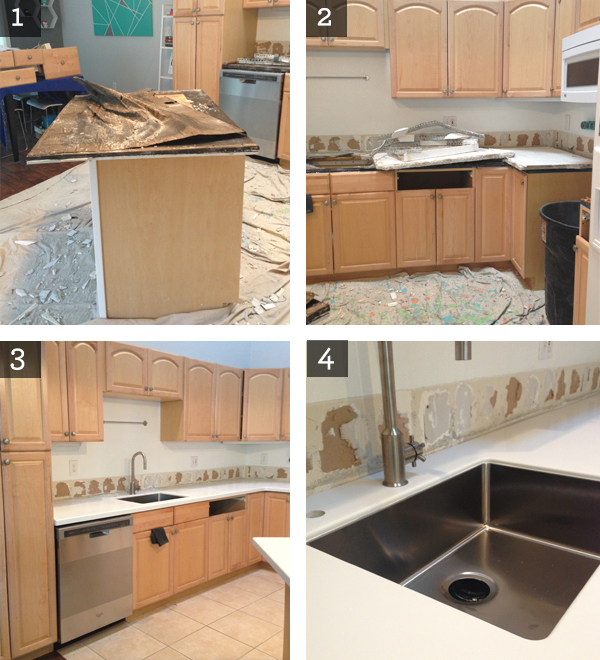 Here are some photos of the progress and a sneak peak of the finished countertops. I'm giving a sneak peak of the countertops mostly because I haven't had a chance to take a good picture. My living room/dining room are a disaster area because we've moved everything out of the kitchen. My favorite part is that amazing undermounted sink. I freaking love it! Especially compared to chunky, round ceramic sink we had before. We got the sink and faucet from Ikea, since they seemed to have the best price for more modern kitchen fixtures.